So my New Years resolution this year is to be vegetarian. So far it’s been good! My boyfriend decided to do this with me, so it’s nice to have some support. My step-mother has also been a vegetarian for over 10 years so I have support from her as well. 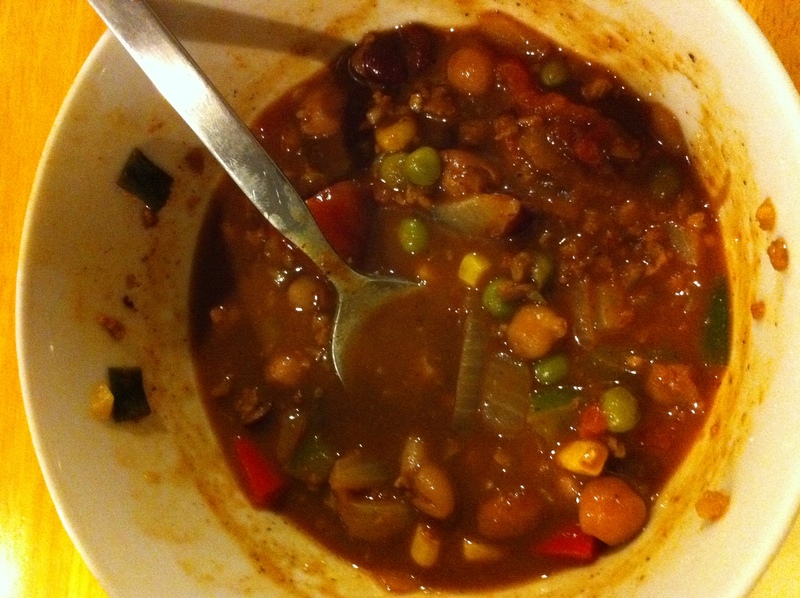 Anyways, when her and my dad got married this summer they served this chili. When I was eating it I didn’t even realize it was vegetarian but it was SO good. She sent me the recipe before New Years so I could start off vegetarianism the right way! Saute the garlic and onions in the olive oil. Add the ground round, making sure to crumble and stir thoroughly. Add all the other veggies (I added the green onion here). Add the chili powder and cayenne pepper. Stir to blend. Simmer for 45 minutes to 1 1/2 hours. Stir in chocolate chips (until melted). Hi! I will definitely have to share this with my vegetarian sister, I’m not technically vegetarian but, since we have a veggie friendly member in our family, meat-eating occasions are rare.